Do you live in the Clifton, Clifton Village or Redland area of Bristol? prevent injury, improve your posture, improve and work on core stability and muscles, work on your mobility and flexibility, improve the comfort of your back, reduce stress and tension? Are you searching for 1:1's or a Pilates class in Clifton that has an encouraging, engaging and knowledgeable teacher? Or perhaps you are looking for somewhere that can deliver a Pilates class at a level to suit you? If so, then our Clifton Bristol 1: 1 sessions or Pilates Classes are for you. In Clifton we have a small Pilates Studio on Whiteladies Road. It is equipped with a Reformer(allegro 2), Tower bar and Combo Chair which are 3 of the main pieces of Pilates equipment used in Pilates Studios. 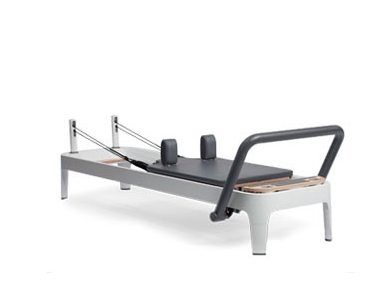 Our Reformer is the latest innovation from balanced body and is based on the original Reformer designed by Joseph Pilates. We will also incorporate props and Mat work into you session. 1:1’s are suitable for all and we can tailor the session to your needs, wants and goals. Find out more about 1:1's. 1:1 bookings for Clifton are done via Email. Do you suffer with a bad back or are you recovering from a injury and have been advised to do Pilates Classes? If so, contact us before booking online so we can guide you to the most appropriate way to take Pilates. For Pilates Mat Classes in Clifton we have a flexible and easy booking system with no need to sign up for a term. Simply choose 1 , 5 or 10 classes and book into classes that suit your schedule. You can reschedule your class up to 24 hours before the class. Want to improve your Mat Pilates? You may wish to take a 1:1 Pilates session every few months as you can use the session on the equipment to improve a certain Mat work exercise or to improve your mat work in general. This is because the equipment can challenge and facilitate the Pilates Mat work, and you will have a full 55 minutes with your class instructor - focusing in on you and how you move. This can be invaluable to your mind and body and you will really feel the benefit in your next Mat Pilates class. Want to take Reformer Pilates? If you want to take Pilates and have the opportunity to take 1;1’s then why not gain all it’s benefits quicker than you would in class situation. You can work at a pace that suits you, using exercises that suit the benefits you wish to gain from Pilates. You may wish to turn a 'bad back' into a 'good back’; improve your core strength; or create fantastic posture, flexibility and comfort within your whole body. Have you been recommended to do Pilates due to a bad back or another discomfort? If so, during your 1:1 Pilates session we will work within the contraindications for your injury and ensure that your session is pain free. We will work with your healthcare professional (Osteopath, Physiotherapist, Chiropractor etc) so we can work together to help you through your rehabilitation. Polestar Pilates Instructor in training? We offer mentoring with Becky A’Hearne in Cirencester and Bristol. Becky can work with those who have taken or are currently doing Polestar Pilates Mat Instructor training, Polestar Pilates Reformer Instructor training, or Polestar Pilates Comprehensive instructor training. Becky has mentored with Polestar for 7 years and been qualified for 15 years. She can help mentor you though your instructor training journey. We run our Clifton classes at The Exercise Club at the top of Whiteladies road. 1:1 SESSIONS ARE ALSO AVAILABLE in most of our locations and also in the comfort of your own home.